PLUS: 50% off massage treatments! Get 50% off massage treatments! Guests love the pretty much daily appearance of elephants at Impodimo – they come for a mud bath at the lodge’s waterhole before wandering up to the swimming pool to drink! The camp is unfenced – so keep a look out for animals grazing in the bush as you enjoy using your outdoor shower! Not as good as the Sabi Sands in terms of leopard sightings – then again Madikwe is famous for its fantastic wild dog sightings which are arguably even more special! pretty much every day the ellies visit the lodge’s waterhole for a mud bath and wallow before heading up the lodge swimming pool for a good slurp of the crystal-clear pool water! 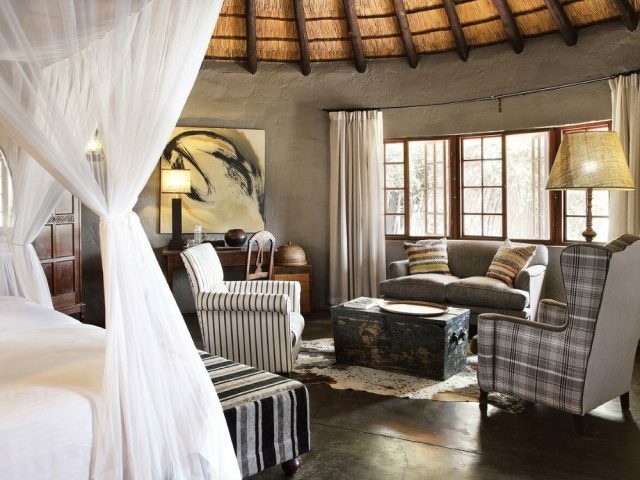 But great guiding and game viewing is far from being Impodimo’s only strength – the lodge itself is also gorgeous! 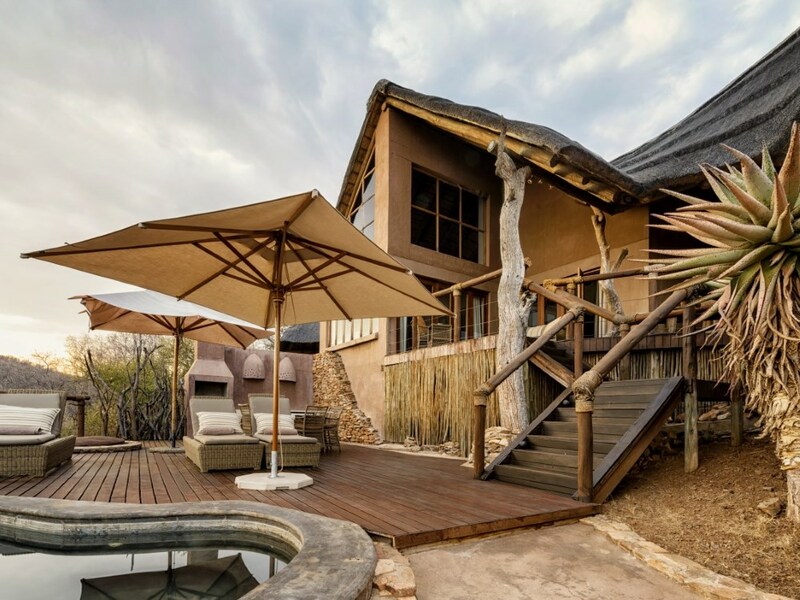 If you’re a family and looking for an even more exclusive experience, then the Deluxe suites are perfect as they can each sleep 4 adults and 2 children and also boast their own bar, private boma and plunge pool, all with excellent views of the bushveld including a very active waterhole – you’re also spoiled with a private vehicle, ranger and tracker, chef and butler service! Whichever room type you stay in though, children are welcome at Impodimo and your kids may participate in the kiddies program, where they are entertained with fun and educational activities, with even a kiddies bumble safari which is designed to focus on the little things in the bush with an emphasis on younger children safety – don’t worry mums, close encounters with big game are avoided! The main lodge itself is lovely and you will be able to enjoy spectacular views extending as far as the eye can see. In the warmer summer months you’ll no doubt spend many hours lazing around the pool deck or lapa with a cold beer or glass of chilled sauvignon blanc. With any luck while you’re down there you’ll get to enjoy the regular visit of the elephants – pretty much every day the ellies visit the lodge’s waterhole for a mud bath and wallow before heading up the lodge swimming pool for a good slurp of the crystal-clear pool water! (pretty much their equivalent then of guests going for a massage and then heading to the bar for a drink!) The big question is will you be brave enough to share the pool water with the ellies whilst you’re still in it! During the cooler winter months, you can retire to the library with a good book or relax in the cosy lounge or bar and enjoy a warming glass of red wine next to the spectacular open fire! 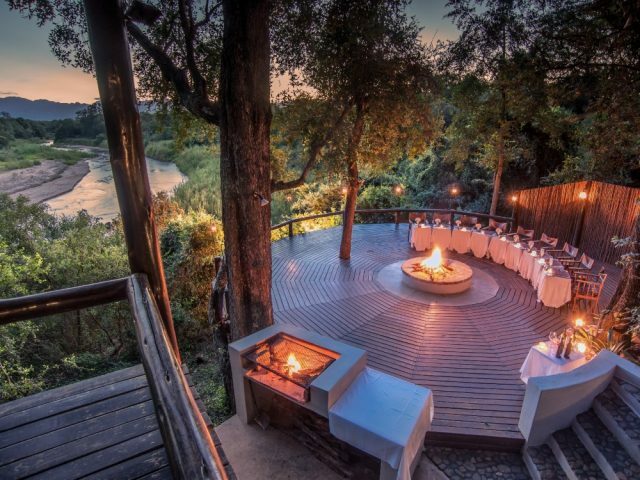 Meals are enjoyed on the pool deck or in the open air boma where you can get to share your day’s game drive adventures around the fire with your ranger and fellow guests. As mentioned previously, the twice-daily game drives in open 4x4 vehicles are a major highlight of your stay at Impodimo. The lodge brought in Shangaan trackers specifically to enhance the quality and frequency of sightings - particularly on the more rarely seen animals. There’s little doubt that this improves the wildlife viewing experience as your ranger has to drive the vehicle, communicate with guests and spot game - with a tracker there's an extra pair of very sharp and experienced eyes, and most importantly they are able to leave the vehicle and follow tracks on foot. When appropriate you will be able to drive off-road to view these icon animals and as a result the sightings of species such as leopard are more frequent – and as they become increasingly accustomed to the presence of vehicles the animals become more relaxed too and the quality and duration of sightings improve. 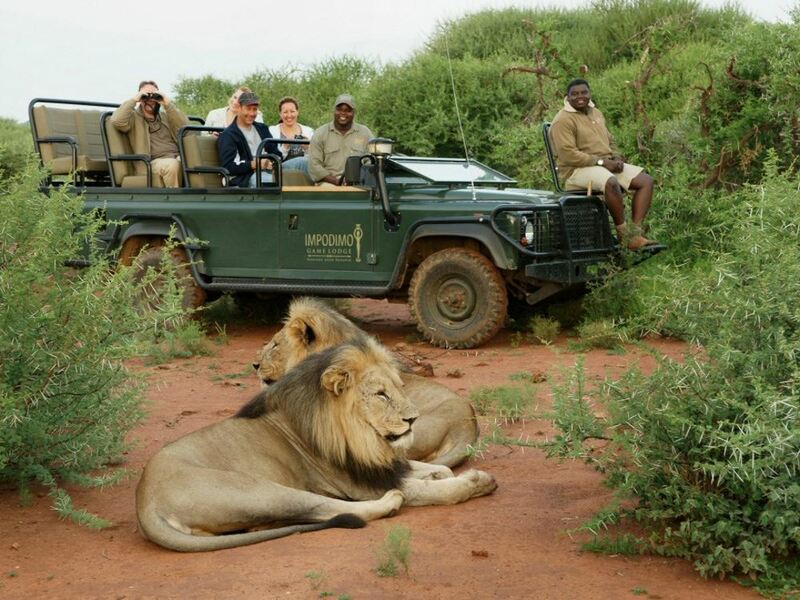 The end result is that Impodimo is arguably THE lodge to visit in the Madikwe for great game sightings!